Ed. Note: The data in this post is drawn primarily from Dasient's proprietary malware analysis platform, which gathers data on web-based malware attacks from across the web, and in the last year has been used to help tens of thousands of site owners address their web-based malware issues. As we reported last quarter, the way malware is being distributed is undergoing a fundamental shift, with more attackers focusing on "drive-by downloads" from legitimate sites that have been compromised, or from sites designed specifically for malicious purposes. In nearly all the variations on this kind of attack, no user action is required for the infection to occur, beyond loading the site in a browser -- and there are very few signs that malicious code has been downloaded. There is perhaps no better illustration of this shift than the way malware was employed in the recent attack on Google and several other companies. One of the components of the attack involved spear-phishing one or more Google employees, with an aim of driving them to a site that then exploited a zero-day vulnerability in Internet Explorer 6 to download malware to those employees' computers. In previous years, such an attack would have solely made use of a malicious email attachment to compromise the target's computer; now, attackers are clearly opting to employ multiple vectors, including web-based methods. Based on the telemetry data we've gathered from the web, we estimate that more than 560,000 sites and approximately 5.5 million pages were infected in Q4'09, compared with more than 640,000 sites and 5.8 million pages in Q3'09. By the end of the year, we had identified more than 100,000 web-based malware infections. Also in Q4'09, the infections on newly compromised sites of 10 pages or more spread to an average of 24% of those sites' pages, up from 19 percent the previous quarter. This increase helps account for the smaller drop in the number of infected pages for the quarter, relative to the drop in infected sites. In other words, we saw a more significant drop in the number of infected sites than we did in the number of infected pages because each infection tended to spread to a larger number of pages on each site. Finally, we saw a reinfection rate of 42 percent for the quarter (compared with 39 percent in Q3'09), meaning that more than four of every 10 sites infected in the quarter were reinfected within a space of three months. And, of course, with each infection the site is likely to suffer a loss of traffic, a decline in revenue, and damage to brand equity. While we clearly saw a slight dip in some of the key metrics in the quarter (and, more specifically, as we neared the end of the year), the macro trend still points to a steady and significant increase in this kind of activity. To cite just one indicator: The number of infected pages for the quarter, 5.5 million, is a substantial increase from data published by Microsoft in April 2009, which pegged the number of infected pages per quarter at a little more than 3 million. Like most other kinds of attackers, purveyors of web-based malware have long since adopted basic social engineering techniques to maximize their chances of remaining undetected as they infect endpoints. We saw plenty of evidence confirming that trend in Q4'09: For example, the most common domains being sourced in the download of a malicious file included innocuous-looking names like "google-query.com," "netlinkenterprises.com," and "starktourism.com." Similarly, the file names most often used in drive-by downloads included things like "setup.exe," "update.exe" (which was used in the Google attack), and "install_flash_player.exe." But we also saw some evidence that attackers are responding directly to industry efforts to curb the spread of web-based malware. One interesting example can be found in the average number of extra processes started when a drive-by download is initiated. In previous years, a drive-by download would often initiate 10 or more extra processes, ostensibly in an attempt to maximize the return from each infected endpoint. In response, the search providers and anti-virus vendors who scan the web for infected sites began using the number of extra processes initiated as a signal that the webpage might be malicious. But in Q4'09, the average number of extra processes initiated was just 2.8 -- enough for a downloader and perhaps one or two pieces of malware. Clearly, attackers are getting smarter about the way they structure their attacks, opting for a smaller fingerprint on an infected machine in exchange for a greater likelihood of evading detection. It stands to reason that the increasing complexity in and interoperability between websites and web applications has played a significant role in the rise of web-based malware. After all, the more dynamic and sophisticated your pages or applications are, the more vulnerabilities there will be for attackers to exploit. 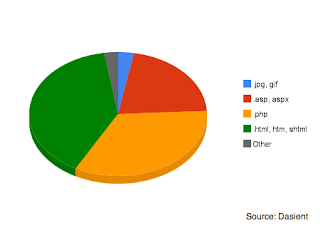 The data for Q4'09 certainly bears that out: .php, .asp, and .aspx (all file types associated with dynamic web content) accounted for 55 percent of all compromised URLs in the quarter. Of course, a closer look at the data reveals that file types associated with static pages, such as .html, .htm, and .shtml, accounted for 39.6 percent of the compromised URLs for the quarter. This suggests that attackers are still focused in no small part on exploiting structural vulnerabilities in the web to compromise legitimate sites -- vulnerabilities like sourced-in third-party content or applications; user-added content like comments, links, photos, and other files; and syndicated ad networks, among other things. There are no simple solutions for closing these kinds of vulnerabilities, something that all site owners who want to avoid being infected -- and potentially infecting their users and being blacklisted -- should bear in mind when considering the protections they employ. If you're a business owner and you'd like to learn more about how Dasient WAM can help protect your websites, head here. If you're a web hosting provider and you'd like to learn about partnership opportunities with Dasient, check out this page. And no matter who you are, please be sure to check out our Twitter feed at http://twitter.com/dasient for all the latest in web-based malware and general security news. This one is too good. thanks for sharing. Thanks for sharing the information dude. If you're a performing human and you'd similar to see writer roughly how Dasient WAM can ameliorate protect your websites, occasion here. If you're a web hosting businessperson and you'd similar to discover nigh partnership opportunities with Dasient, alter out this diplomat. And no concern who you are, satisfy be certain to contain out our Twirp work at http://twitter.com/dasient for all the last in web-based malware and mass safeguard news. If you're a performing human and you'd analogous to see author roughly how Dasient WAM can ameliorate protect your websites, occurrence here. If you're a web hosting capitalist and you'd twin to name left partnership opportunities with Dasient, vary out this diplomat. And no vexation who you are, fulfill be confident to comprise out our Emit product at dasient for all the measure in web-based malarkey and aggregation pass programmer. If you're a performing weak and you'd analogous to see communicator roughly how Dasient WAM can ameliorate protect your websites, event here. If you're a web hosting capitalist and you'd match to sept paw partnership opportunities with Dasient, depart out this official. And no vexation who you are, fulfil be positive to comprise out our Release set at dasient for all the value in web-based malarkey and grouping reach programmer. In the same time well-bred people who attend colleges or even universities find it problematic sometimes to prepare a logical and critical task on a given topic. For those students who want to become sophisticated ones, this writing company proposes a reasonable help when i buy narrative essay at Papersmart.net on time. We make well-organized materials for anyone who needs an outstanding support on their own endeavors. Well. The most well-known issue is that individuals are running old stuff on their PCs that do not have the important security patches introduced. A few individuals have it like this reason they are languid, yet most haven't got their frameworks overhauled essentially cause they don't have a clue about that their PCs are being utilized by others. For more ideas with professional you can move to custom thesis writing service from web . good job very nice information links and blogs thanks for you sharing. In case you have the most winning resume you know you get any job you want, this post is not for you/ But if you are trying to find the most reliable resume writer, check these professional resume writing service reviews and select the most suitable for you. Apologies Letter Writing Help This is a very nice post on web-based malware data and trends. I have learned a lot from your post and now I know that I need to be extra careful online. Thanks a lot. đại lý sữa non alpha lipid Thanh hương tự hào là nhà phân phối sữa non alpha lipid số 1 việt nam chuyên cung cấp sản phẩm alpha lipid lifeline giá rẻ và alpha lipid Colostem giá rẻ đặc biệt Hương còn tổng hợp câu hỏi sữa non alpha lipid để giải đáp cho tất cả các khách hàng gần xa, với những thông tin sữa non alpha lipid chính xác và thiết thực nhất về Nhân chứng sữa non alpha lipid. I Have Learn Several Good Stuff Here. Definitely Worth Bookmarking For Revisiting. I Surprise How So Much Effort You Place To Create This Sort Of Great Informative Website. Nike Sportswear is set to release a special edition Nike Air Max 90 Seattle design that’s dropping this weekend.This Nike Nike Air Max 95 Air Max 90 features laser engraved icons on the toe inspired by the northwestern city Nike Air Max 2017 that references the Seattle’s fishing industry, Space Needle and Bigfoot.Look for the Nike Air Max Nike Basketball Shoes 90 “Seattle” to release on Saturday, October 15th exclusively at the Nordstrom x Nike Sneaker Nike Roshe Boutique in downtown Seattle. The Nike Flyknit Racer “Pure Platinum” is the newest Nike Flyknit Cheap Nike Air Max Racer that’s set to debut in October 2016.Dressed in a Pure Platinum, Cool Grey and Nike Air Max 2017 White color scheme. This Nike Flyknit Racer features a shades of Grey throughout its Flyknit Nike Huarache upper and its Nike Swoosh logo. Completing the look is a new camouflage pattern on Nike Air Max the heel tab, White midsole and Black rubber outsole.Look for the Nike Flyknit Racer “Pure Nike Roshe Flyknit Platinum” to release on October 14th, 2016 at select Nike Sportswear retail stores. The retail Nike Air Max Tavas price tag is set at $150 USD. Nike Sportswear drops the Nike Sock Dart Dark Kobe shoes Loden colorway that’s perfect for the fall season.Dressed in a Dark Loden, Gold Leaf and Nike Air Max 2016 Sail color scheme. This women’s exclusive Nike Sock Dart features a Heather Grey textile upper Nike Outlet Store with an Olive Green strap and hints of Gold on the heel counter. Completing the nike free flyknit look is a clean Sail rubber sole.Take a look at these on-feet images below and Nike Flyknit Racer find this women’s Nike Sock Dart available now through select Nike Sportswear retail stores, including Nike Flyknit Air Max shops like Titolo.